SYDNEY - When Ms Marita Cheng turned up for the first few classes of her engineering degree in Melbourne, she noticed a striking imbalance. In a class of about 50 students, there were only four girls. And she soon discovered that in the field of engineering, this gender imbalance is the norm. In Australia, about 10 per cent of engineers are women - and the figures are not much better around the world. It was this divide that prompted Ms Cheng, now 23, to create Robogals, a student-run organisation aimed at encouraging schoolgirls to take an interest in science and technology. Since it was founded in 2008, Robogals has held workshops for over 3,000 of them in Australia. It has also set up chapters in the United States, Britain, Ireland, Japan, New Zealand and The Netherlands. For her efforts, Ms Cheng was chosen as this year's Young Australian of the Year. 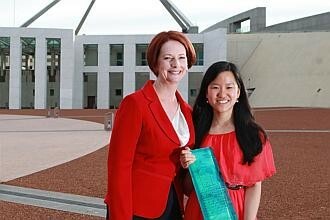 The award, given to those considered inspirational leaders and role models, not only allowed Ms Cheng to meet Prime Minister Julia Gillard and Governor-General Quentin Bryce, but also thrust her into the media spotlight. She said that the experience of winning was 'surreal' and pledged to use the title to further her quest of promoting science to girls and spread the Robogals message. 'We try to give girls get a sense that they can make a difference in the world,' Ms Cheng tells The Straits Times. At the workshops held in schools, girls aged 10 to 14 are taught by volunteers how to program computers and build Lego robots, using components such as motors and light and colour sensors. A survey last year of 348 schoolgirls who participated in the workshops found that the hands-on training gave a huge boost to their interest in engineering. For Ms Cheng, what first sparked her interest in science as a child was watching her older brother run home experiments. Ms Cheng, who is soon to complete her engineering degree at Melbourne University, was born in Cairns, Queensland. She attributes much of her determination and success to her greatest inspiration - her Hong Kong-born mother. Divorced shortly after Ms Cheng was born and speaking only Cantonese, she worked seven days a week as a kitchen hand and cleaner to raise her children. That can-do spirit clearly fuels Ms Cheng in her mission to challenge the perception that girls do not have the ability in maths and science, and that engineering is mainly for boys. This perception affects not only students but teachers, parents and career guidance counsellors, she adds. Robogals has attracted growing numbers of student volunteers and is continuing to expand internationally. After graduating, Ms Cheng is shooting for her own robotics company, possibly in Silicon Valley.